There was a mistake in the color of the arrow of Figure 1A as published. Red arrows should be white and white arrows should be red in Figure 1A. The corrected Figure 1 is below. The authors apologize for the mistake. This error does not change the scientific conclusions of the article in any way. Figure 1. Cytological observation of P. simonii × P. nigra PG and PTG. (A) DAPI fluorescence image of two-celled and three-celled pollen. 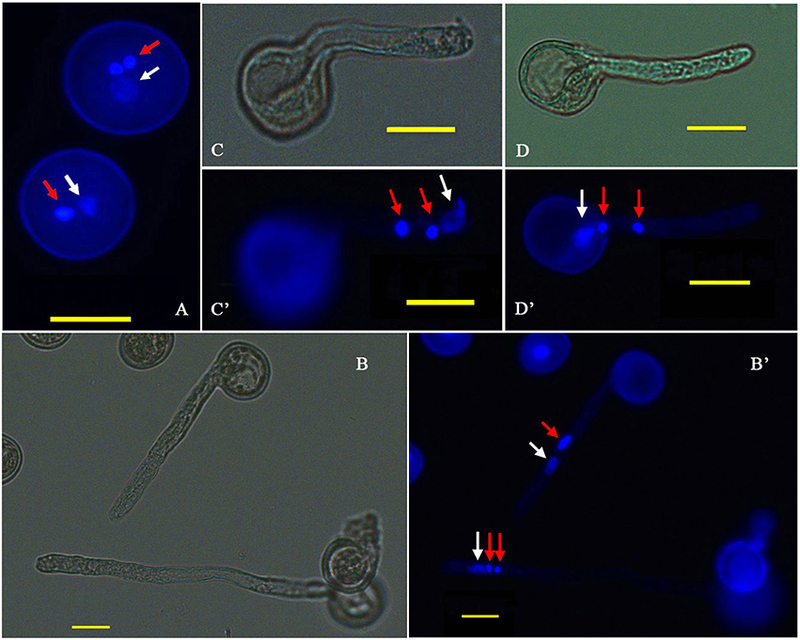 (B,B′) Bright-field and DAPI fluorescence images of the two and three nuclei states in the tube; red arrows show generative nuclei or two sperm nuclei, and white arrows show vegetative nuclei. (C,C′) Bright-field and DAPI fluorescence images, respectively, of the vegetative nucleus leading the sperm nucleus into the PT. (D,D′) Bright-field and DAPI fluorescence images, respectively, of two sperm nuclei moving into the tube before the vegetative nucleus. CY designed experiment. LZ carried out experiments, analyzed experimental results, and wrote the manuscript. HY assisted with results analysis. WG assisted with organizing figures and tables. Copyright © 2016 Zhao, Yuan, Guo and Yang. This is an open-access article distributed under the terms of the Creative Commons Attribution License (CC BY). The use, distribution or reproduction in other forums is permitted, provided the original author(s) or licensor are credited and that the original publication in this journal is cited, in accordance with accepted academic practice. No use, distribution or reproduction is permitted which does not comply with these terms.